The 6th Edition of Dorjee Khandu Memorial State Badminton Championships-2018 kicks off at kalikho Pul Indoor Badminton stadium here at Tezu today. The 6th Edition of Dorjee Khandu Memorial State Badminton Championships-2018 kicks off here at kalilkho Pul Indoor Badminton stadium here at Tezu today. Inaugurating the opening ceremony as the Chief Guest, Minister Sport & youth Affairs, Agri, Horti, Vet, Fishery & Dairy Dr Mohesh Chai call upon the youth of the state to adopt “Sports” as a profession. Dr Chai informed that Department of Sports and Sports Authority of Arunachal have been collectively striving hard to promote Sports in rural as well as urban areas paving ways for the budding youth to explore their hidden talents and compete national and international events. He appeal to parents, elders including all stakeholders to encourage youngsters in sports. Dr. Chai who is also the local MLA of the host district extended his gratitude to Arunachal State Badminton Association (ASBA) for granting permission to host the state badminton mega event in favour of Lohit District Badminton Association (LDBA) which is the first of its kind conducting such major tournament away from the Capital. While welcoming to the participants, MLA informed that Lohit District have attempted to offer their best hospitality and successful conduct of the tournament and appeal all participants to bear the inconvenience caused if any. Dr Chai also disclosed that ASBA is one of best performer among the state level registered Sports Association recognized by the state government and alerted that Govt will not support any grants-in-aid to none performing State level registered Sports Associations. Earlier, ASBA’s Secretary Bamang Tago while presenting the tournament reports recalled contribution of former Chief Minister Late Dorjee Khandu who was a visionary leader who apart from initiating number of welfare programmes and making rapid infrastructural development of Arunachal Pradesh, he pioneered the promotion of badminton throughout the state. However, his dynamic vision could not be fulfilled due to his untimely demised. He Served the Arunachal State Badminton Association (ASBA) as its President from 2000 to till his tragic demise in the year 2011. As a mark of respect to the great soul and his contribution towards the development of badminton in Arunachal Pradesh in particular, ASBA decided to carry forward his mission by conducting State level badminton tournament in the name of late Dorjee Khandu’s memory and made it a calendar event. We acknowledged the family members of late Dorjee Khandu for sponsoring the tournament for four consecutive years starting from 2012 to 2016. Pursuant upon ASBA’s request, the state Government have been extending grants –in-aid to ASBA to the tune of Rupees Twenty Five Lakhs annually to conduct the State level mega event from last year onwards. 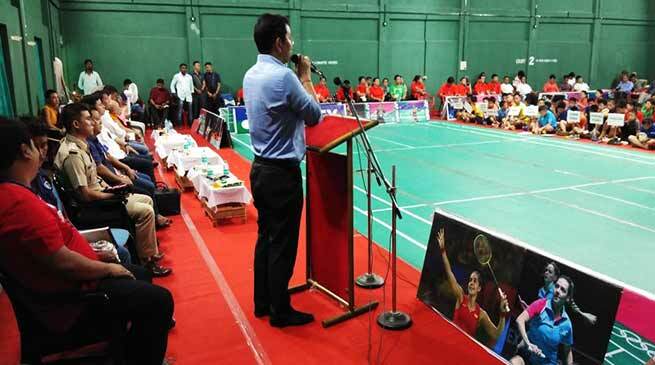 Togo also informed that many promising players have been produced through this tournament within a span of five years and spirit of badminton has captured the minds of the people in urban as well as rural areas keeping the dream of late Khandu alive. The tournament has also become a Talent Hunt event because of the reason that state Ranking and team players are being selected from this tournament. All Twenty two Districts Badminton Associations including Capital complex Badminton Association affiliated with ASBA are taking part in the ensuing tournament with the total of 310 participants from across the state in the following categories: U-13, U-15, U-17, U-19 and open including Mixed Doubles in open categories. MLA Laisam Simai and Tsering Tashi also share their views for promotion of sports and appreciated Local MLA Dr and LDBA for conducting such popular games which will lots of impact in the district in days to come. Chairman Badang Tayang welcomed the dignitaries, participants & Technical Officials. Later, Secretary Lohit District Badminton Association Baplalum Chiba proposed vote of thanks. The opening ceremony was witnessed by Deputy Commissioner, SP, all District Head of Departments and sports lovers in general including President, ASBA Ratu Techi. The District will witness the actions of state’s leading ace shutllers including Laa Talar who has lead the oath that all participating players shall be abide by rules & regulation of tournaments informed organizing Secretary Baplalum Chiba.